The airspace controlled by a Center may be further administratively subdivided into smaller, manageable pieces of airspace called sectors. A few sectors extend from the ground up, but most areas are stratified into various levels to accommodate a wide variety of traffic. Each sector is staffed by a set of controllers and has a unique radio frequency that the controller uses to communicate with the pilots. As aircraft transition from one sector to another, they are instructed to change to the radio frequency used by the next sector. Each sector also has secure landline communications with adjacent sectors, approach controls, areas, ARTCCs, flight service centers, and military aviation control facilities. Figure 2-9. Low altitude sectors. Figure 2-10. 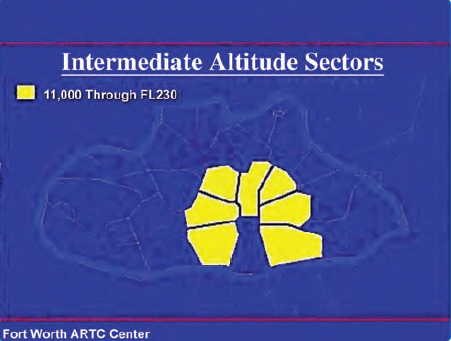 Intermediate altitude sectors. Figure 2-11. High altitude sectors. Figure 2-12. Ultra high altitude sectors. From one to three controllers may work a sector, depending upon the amount of air traffic. Each controller is assigned to work the positions within an area of specialization. Controllers have direct communication with pilots, with surrounding sectors and Centers, plus the towers and Flight Service Stations (FSS) under their jurisdiction. Each control position is equipped with computer input and readout devices for aircraft flight plan data. The Center controllers have many decision support tools (computer software programs) that provide vital information to assist the controllers in maintaining safe separation distances for all aircraft flying through their sector. For example, one tool available allows the controller to display the extended route of any aircraft on the radar screen called a vector line. This line projects where the aircraft will be within a specified number of minutes, assuming the aircraft does not change its course. This is a helpful tool to determine if aircraft flying intersecting routes pass safely within the separation standard, or if they conflict with each other. In addition to vector lines, the controller can also display a route line for any given aircraft on his or her radar screen. This tells the controller where a particular aircraft is in specified number of minutes, as well as the path the aircraft will fly to get there. Decision support tools such as these help each controller look ahead and avoid conflicts. The CFRs require the pilot in command under IFR in controlled airspace to continuously monitor an appropriate Center or control frequency. When climbing after takeoff, an IFR flight is either in contact with a radar-equipped local departure control or, in some areas, an ARTCC facility. As a flight transitions to the en route phase, pilots typically expect a handoff from departure control to a Center frequency if not already in contact with the Center. The FAA National Aeronautical Information Services publishes en route charts depicting Centers and sector frequencies. [Figure 2-13] During handoff from one Center to another, the previous controller assigns a new frequency. In cases where flights may be out of range, the Center frequencies on the face of the chart are very helpful. 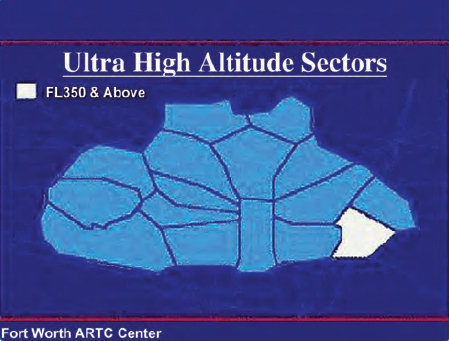 In Figure 2-13, notice the boundary between Memphis, Tennessee and Atlanta, Georgia Centers, and the remote sites with discrete very high frequency (VHF) and ultra high frequency (UHF) for communicating with the appropriate ARTCC. These Center frequency boxes can be used for finding the nearest frequency within the aircraft range. They also can be used for making initial contact with the Center for clearances. The exact location for the Center transmitter is not shown, although the frequency box is placed as close as possible to the known location. During the en route phase, as a flight transitions from one Center facility to the next, a handoff or transfer of control is required as previously described. The handoff procedure is similar to the handoff between other radar facilities, such as departure or approach control. During the handoff, the controller whose airspace is being vacated issues instructions that include the name of the facility to contact, appropriate frequency, and other pertinent remarks. Accepting radar vectors from controllers does not relieve pilots of their responsibility for safety of flight. Pilots must maintain a safe altitude and keep track of their position, and it is their obligation to question controllers, request an amended clearance, or, in an emergency, deviate from their instructions if they believe that the safety of flight is in doubt. Keeping track of altitude and position when climbing, and during all other phases of flight, are basic elements of situational awareness (SA). Aircraft equipped with an enhanced ground proximity warning system (EGPWS), terrain awareness and warning system (TAWS), or traffic alert and collision avoidance system (TCAS) help pilots detect and/or correct for potential unsafe proximities to other aircraft and increases pilot(s) situational awareness. Regardless of equipment, pilots must always maintain SA regarding their location and the location of traffic in their vicinity. Special high altitude routes allow pilots routing options for flight within the initial high altitude routing (HAR) Phase I expansion airspace. Pilots are able to fly user-preferred routes, referred to as non-restrictive routing (NRR), between specific fixes described by pitch (entry into) and catch (exit out of) fixes in the HAR airspace. Pitch points indicate an end of departure procedures, preferred IFR routings, or other established routing programs where a flight can begin a segment of NRR. The catch point indicates where a flight ends a segment of NRR and joins published arrival procedures, preferred IFR routing, or other established routing programs. 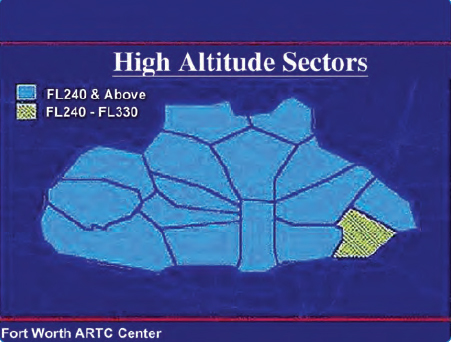 The HAR Phase I expansion airspace is defined as that airspace at and above FL 350 in fourteen of the western and southern ARTCCs. The airspace includes Minneapolis (ZMP), Chicago (ZAU), Kansas City (ZKC), Denver (ZDV), Salt Lake City (ZLC), Oakland (ZOA), Seattle Centers (ZSE), Los Angeles (ZLA), Albuquerque (ZAB), Fort Worth (ZFW), Memphis (ZME), and Houston (ZHU). Jacksonville (ZJX) and Miami (ZMA) are included for east-west routes only. To develop a flight plan, select pitch and catch points which can be found in the Chart Supplement (CS) based upon your desired route across the Phase I airspace. Filing requirements to pitch points, and from catch points, remain unchanged from current procedures. For the portion of the route between the pitch and catch points, NRR is permitted. Where pitch points for a specific airport are not identified, aircraft should file an appropriate departure procedure (DP), or any other user preferred routing prior to the NRR portion of their routing. Where catch points for a specific airport are not identified aircraft should file, after the NRR portion of their routing, an appropriate arrival procedure or other user preferred routing to their destination. Additionally, information concerning the location and schedule of special use airspace (SUA) and Air Traffic Control Assigned Airspace (ATCAA) can be found at http://sua.faa.gov. 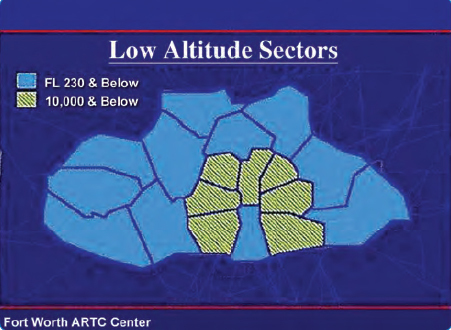 ATCAA refers to airspace in the high altitude structure supporting military and other special operations. Pilots are encouraged to file around these areas when they are scheduled to be active, thereby avoiding unplanned reroutes around them. 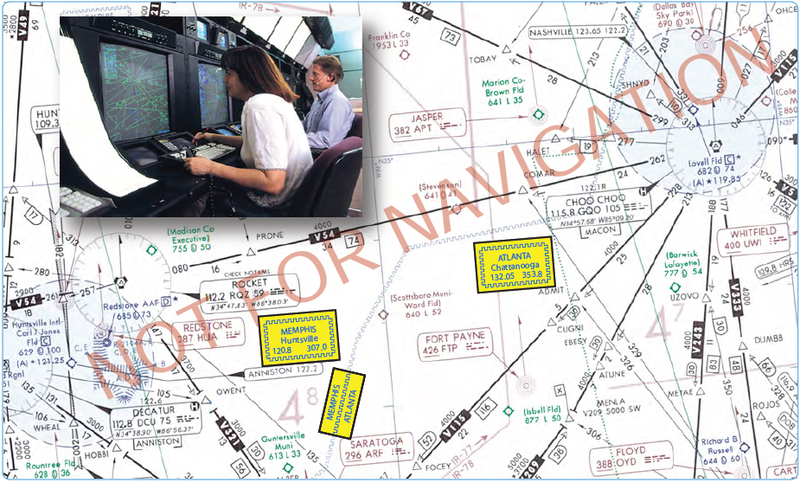 In conjunction with the HAR program, area navigation (RNAV) routes have been established to provide for a systematic flow of air traffic in specific portions of the en route flight environment. The designator for these RNAV routes begin with the letter Q, for example, Q-501. Where those routes aid in the efficient orderly management of air traffic, they are published as preferred IFR routes.